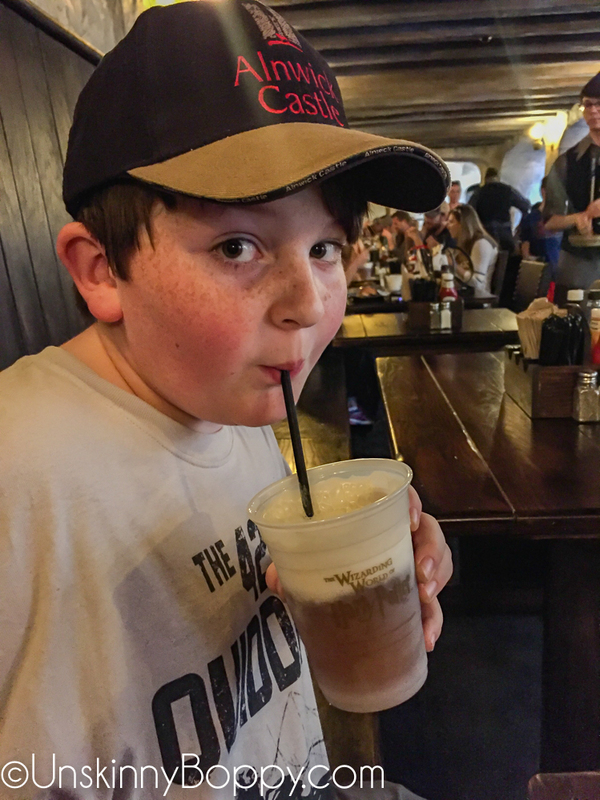 When my son Garrett turned 9, Harry Potter came into my life for the first time. Up until that point, I had never even cracked open a book or seen a single movie in the series. I was in college when the first book came out in 1997 and a newlywed by the time the series ended in 2006, so I totally missed the original phenomenon because I was busy doing, um… other things. 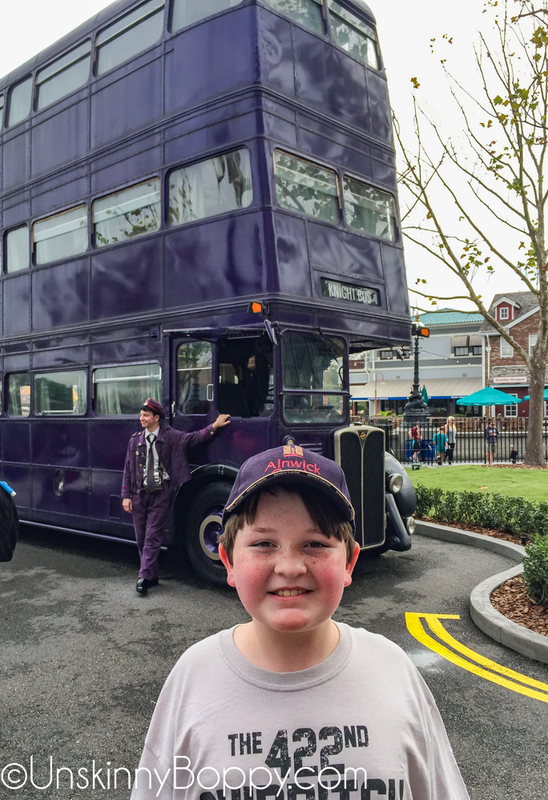 But that all changed rapidly when my little muggle boy became obsessed with the Wizarding World of Harry Potter. We started out by reading the first book together, and pretty soon we were both smitten. From there I bought the audiobooks so we could listen to them on our long commute home from school. We have a 30-45 minute ride, depending on traffic, so this was a great way to pass the time. As soon as he climbed in the car he would be begging to listen to the next installment of the audiobook. I honestly had a hard time waiting for him to finish out the chapters with me. It took us many months, but we finished the entire book series together. And finally, I understood what all the fuss was about. Last year we attended about 12 Harry Potter themed events and Garrett dressed up for every one of them. You may remember we even filmed a Harry Potter Bath and Body Potions video for Halloween last year. 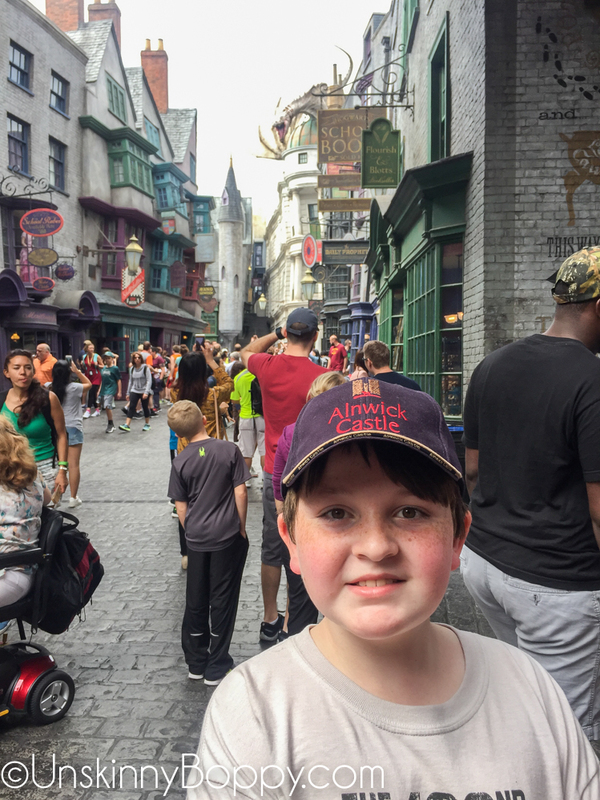 Now that Garrett is the biggest Harry Potter fan you’ll ever meet, we gifted him a trip to Universal Orlando to visit the Wizarding World of Harry Potter as his 10th birthday gift this year. 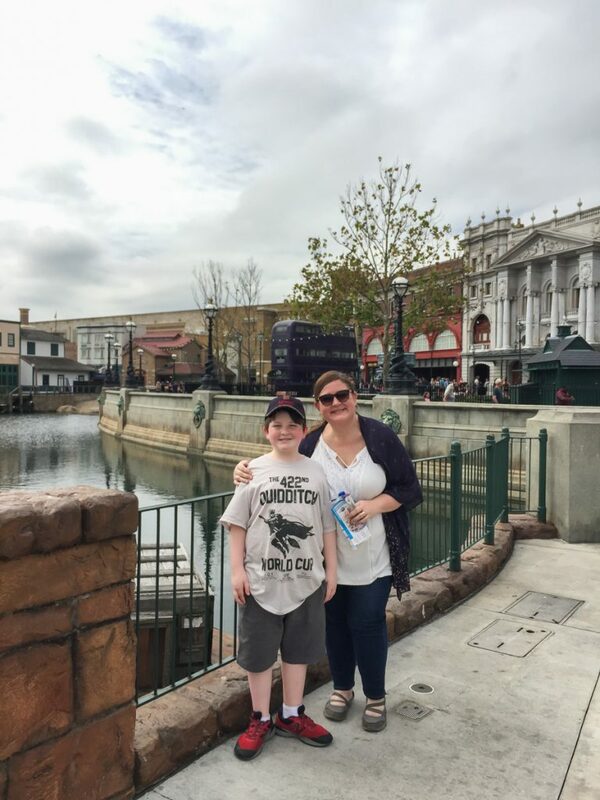 We spent two days at Universal and three days at Disney World. It was THE BEST family trip we have had in a very long time. 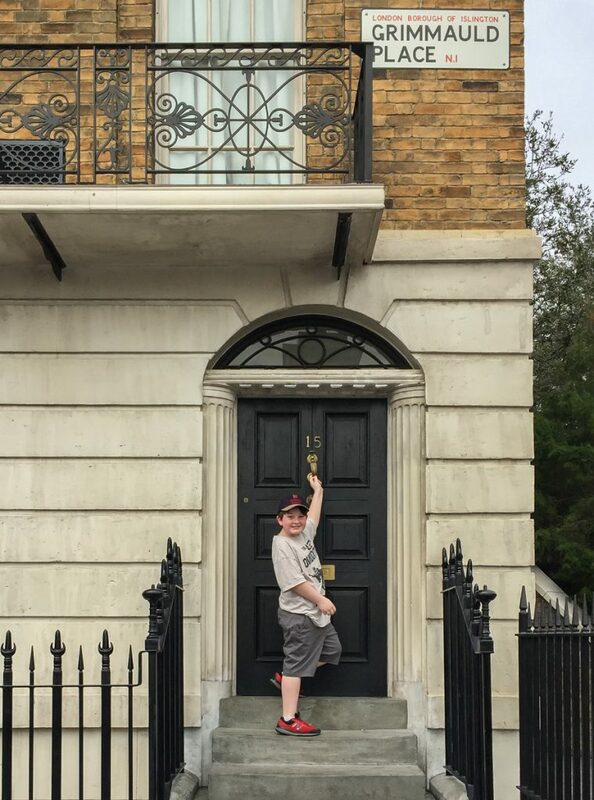 Until you see the tiny sign that says Grimmauld Place and realize you’re there! Then we spotted the Night Bus out front, so we knew we were in the right place. 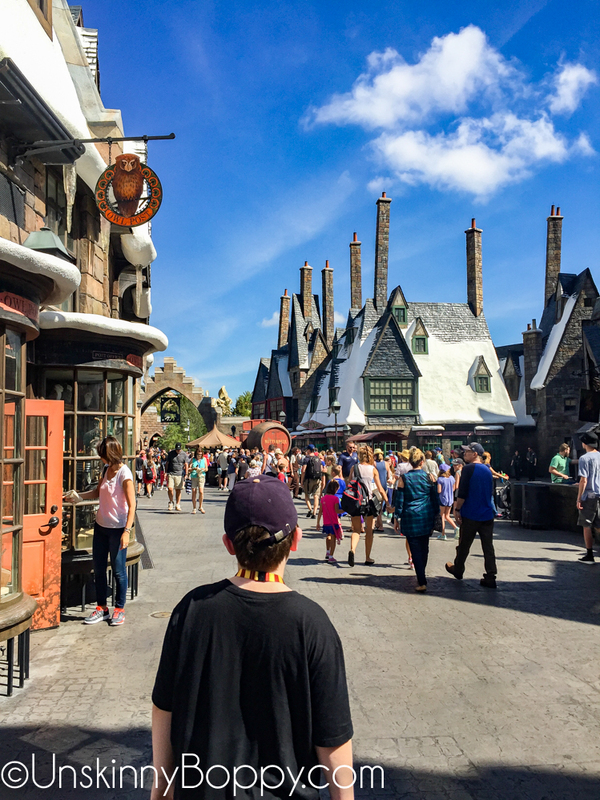 But as soon as you step through the brick tunnel leading into Diagon Alley the whole world shifts and you are stepping straight into the Wizarding World of Harry Potter. 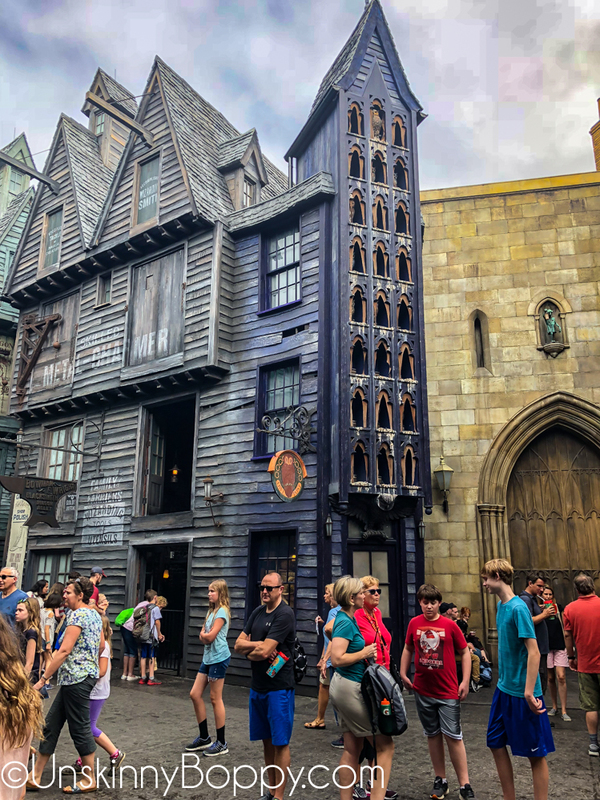 Every single place mentioned in the books has a storefront and most of them have actual stores you can visit and buy memorabilia from all of your favorite Hogwarts houses. If you haven’t read the books, Hogwarts is divided up into four houses that are sort of like fraternities. The House names are Gryffindor (Harry’s house), Ravenclaw, Hufflepuff and Slytherin. Gryffindors are brave, Ravenclaws are creative, Hufflepuffs are nice and Slytherins are evil. I’m pretty sure I would have been a Hufflepuff if I had attended Hogwarts. But the STORES. OH my goodness. 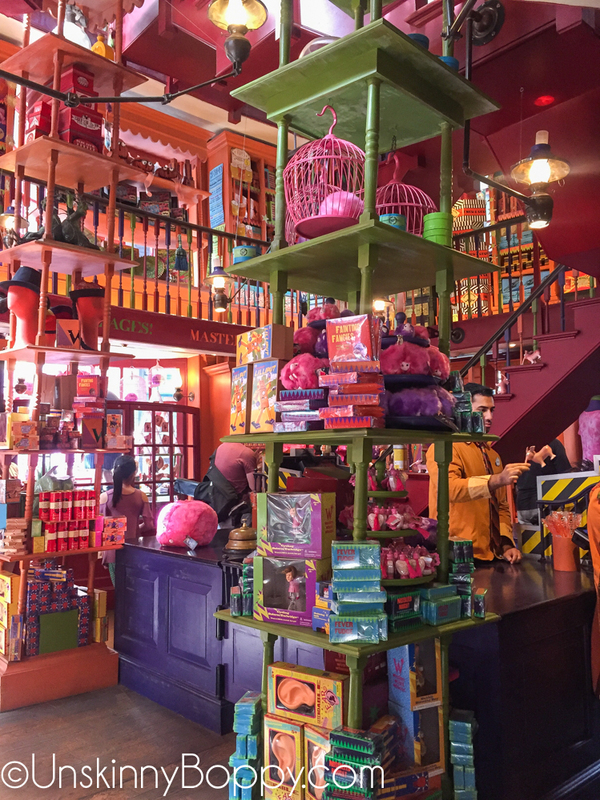 There was a colorful Weasley’s Wizarding Wheezes that sold love potions and extendable ears and You-Know-Poo. From Florean Fortescue’s Ice Cream Parlour to Flourish and Blotts, nothing was overlooked. We saw The Daily Prophet and Madam Malkins Robe Shop… it was ALL there. And we explored every inch of it. I am still drooling over the fish and chips that I ate and wondering how I can get my hands on some more soon. 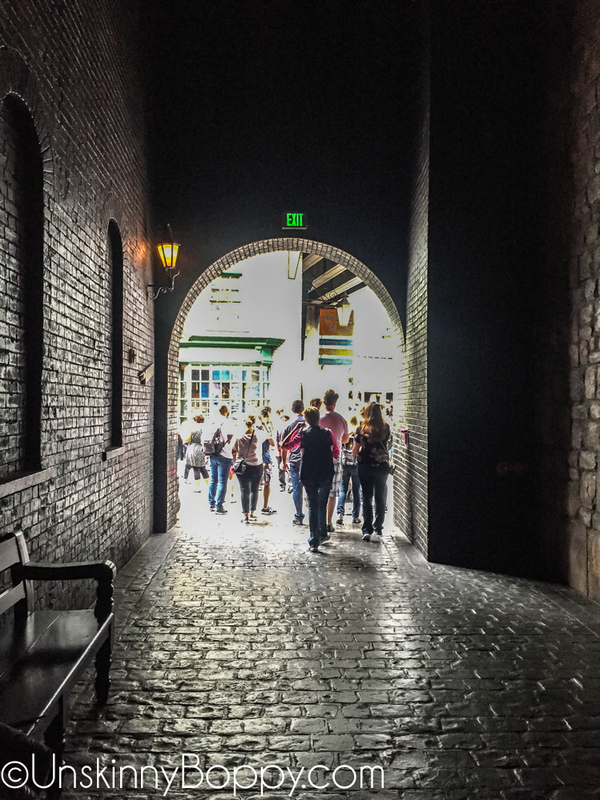 Near the back of the park is Knockturn Alley–which is pronounced like “nocturnally”, by the way. Harry landed here accidentally once when his floo powder took him on an evil detour. It’s the location of Borgin and Burkes, aka Voldemort’s old stomping grounds–and home of the Vanishing Cabinet that leads straight into the Room of Requirement at Hogwarts. If you haven’t figured it out yet, this is where all the evil wizards and Slytherins like to hang out. It’s also where my husband liked to hang out because it was nice and cool and there were plenty of benches to sit on to rest. 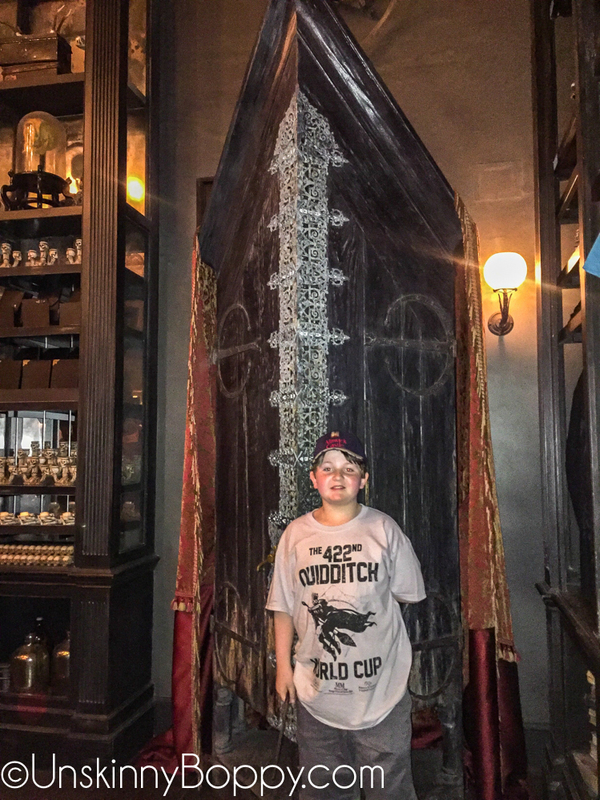 He freakin LOVED Knockturn Alley. Not sure what that says about him…maybe he would have made a good Slytherin? But at the heart of it all is Gringott’s Bank. There is even a fire-breathing dragon on top that shoots flames out of his mouth about 30 feet in the air every few minutes. 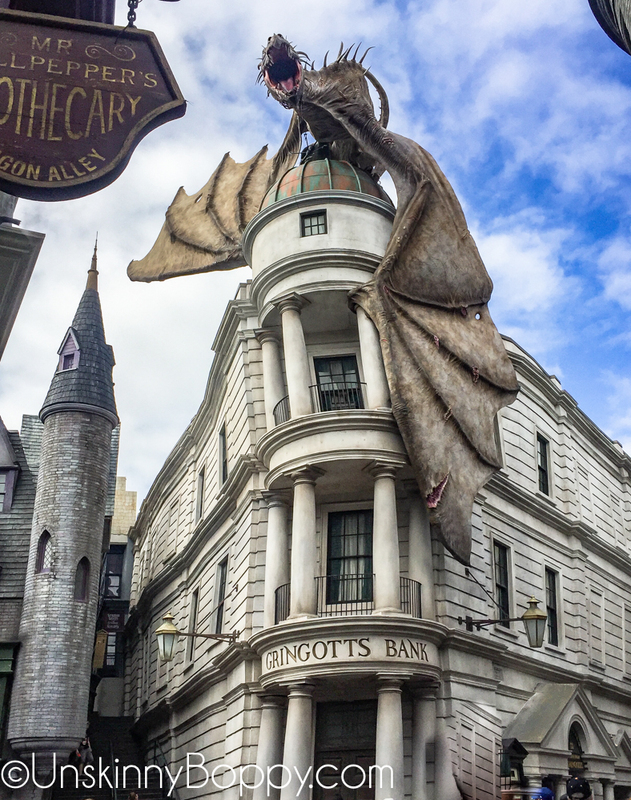 Inside this building is the Escape from Gringott’s ride, which Garrett absolutely LOVED. Now let me tell you about the absolute BEST part of our whole trip. 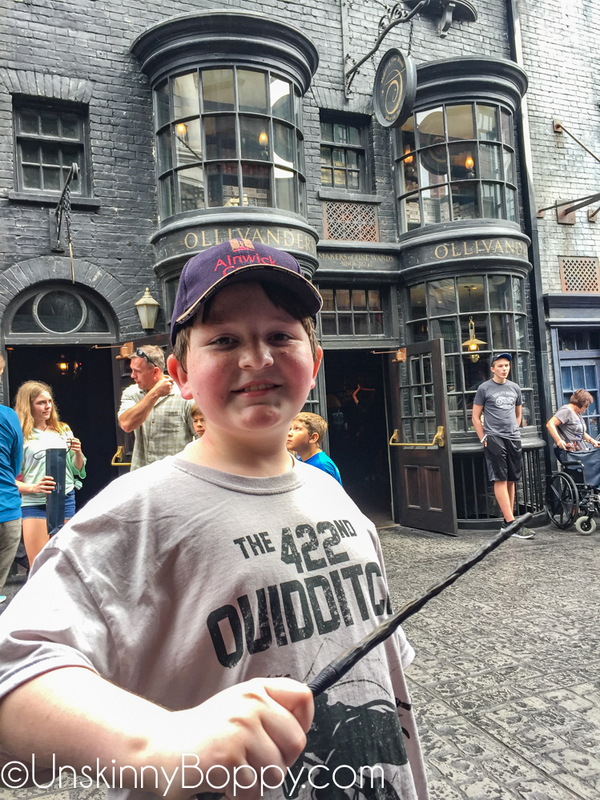 Our first stop inside Diagonally was Olivander’s Wand Shop to purchase a special interactive wand that will only make magical things happen inside the park. We had done our research and knew that Olivander offers a special show where one child gets chosen from the audience for a wand demonstration. We got SO lucky because there was no line to get into this show when we walked up. We found out that Caroline’s stroller was not allowed inside, so our babysitter, Brittany, took her on a little stroll while J and I waited to go inside Olivander’s with Garrett. We were so grateful to have Brittany on this trip with us so we could experience things like this without one of us wrestling with a bored 2-year-old. Finally, we were allowed to go inside along with about 15 other people to meet Olivander. The room was extremely dark, so I don’t have any photos to show you. In the books, when Harry goes to Olivander’s to pick out his first wand, he is told that “the wand chooses the wizard.” It takes a few tries with different wands to get the perfect match. They play out this scene with one kid from the audience at each show using three different wands until they find the perfect match. Even though there were only three other kids in the room with us, Garrett did not get chosen to do the wand demonstration. Another kid was picked, and he did a great job of remembering the spells to say to make things levitate and move around the room. His first two tries were a bust, but then on his third try the lights flickered and the music crescendoed and that wand chose him. It was really cool to watch, but Garrett would have had some major anxiety to speak up in front of the whole crowd of people like that. I was thankful he was not chosen because it would have stressed him out pretty majorly. But then, as we were all leaving the room, Olivander stopped the three of us and pulled us all to the side. Everyone left except for us, and we got our own private wand ceremony! Olivander told Garrett that he knew as soon as he saw him that he was a very special wizard. He asked him what house he belonged to (Ravenclaw) and then said he could see that he was a very intelligent and creative person (true). He then pulled out a wand and told G it was calling his name. He asked Garrett to wave it around to try it out, and of course, with just one wave, the lights flickered and the music crescendoed and that wand chose him. 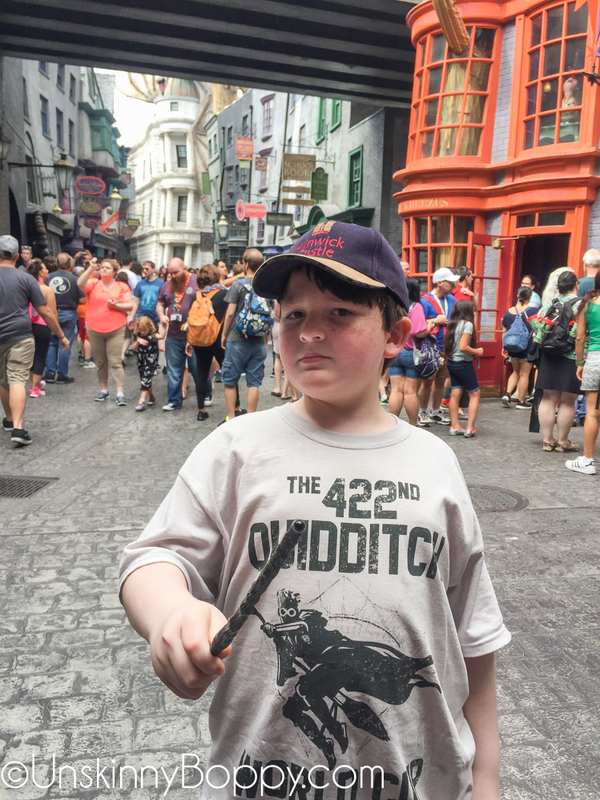 Here is the proud new owner of a 15″ birch wand with a phoenix feather core. Now I’m sure Olivander spied us in the crowd and saw huge gullible dollar signs on our foreheads, but we were going to buy a wand anyway so this was an extra special way to get one. This was such a nice birthday surprise for Garrett and completely shocking because I had never heard of it happening before in all my research. To get a private audience with Ollivander?? WAY FREAKING COOL. 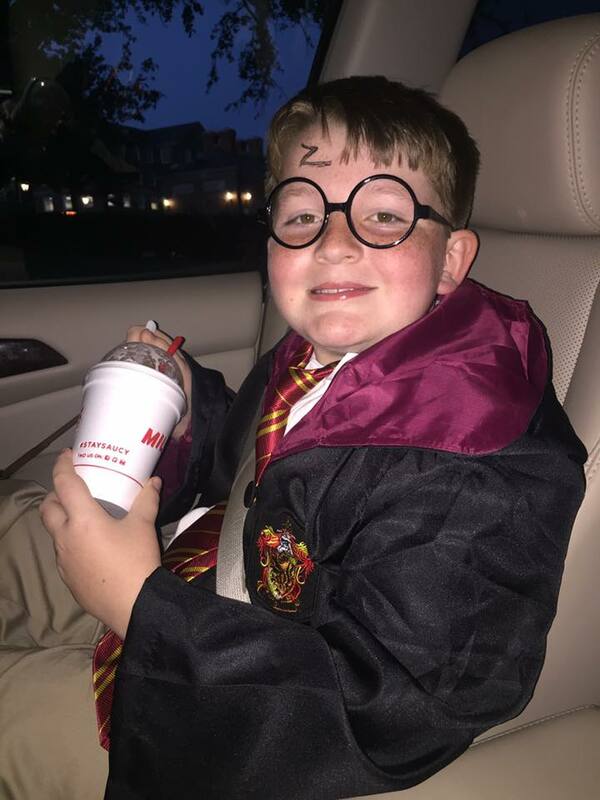 My friend Marcia described it perfectly– she said this was such a special event because at 10 years old Garrett doesn’t believe in magic anymore- he knows that Santa and the tooth fairy and Easter bunny are not real, so there’s not much magic left in this kid’s life. But standing inside that candlelit room and hearing Olivander say what an intelligent and creative wizard he is, we all got to experience a little piece of magic again. And the fact that we were alone without Caroline climbing on our heads made it even more special! So here’s a big “Thank you!” to Mr. Olivander and to Brittany the babysitter, for giving us this very special memory with our little Ravenclaw. We had the BEST time ever, and this was just Day One! Stay tuned for Day Two when we got to ride the Hogwarts Express to Hogsmeade Village and Hogwarts Castle. 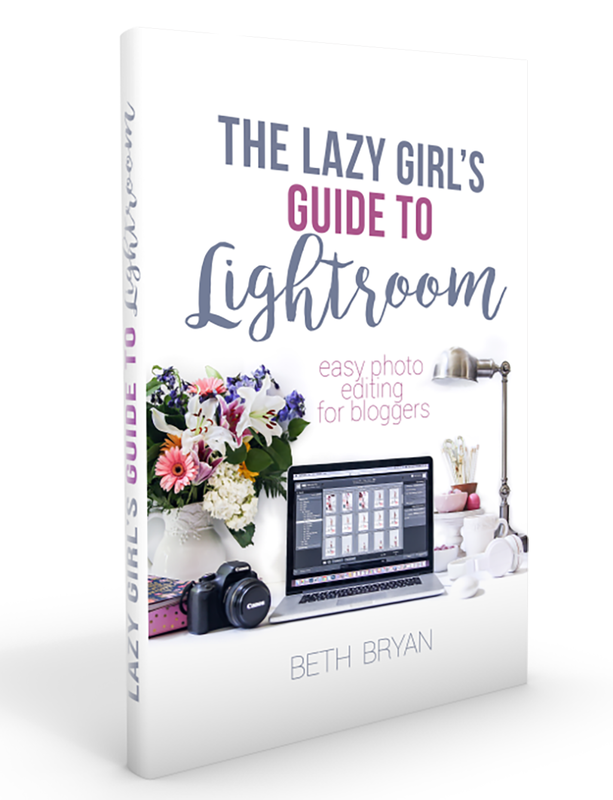 Beth, you make me want to pack up tomorrow and high-tail it to Orlando! John and I were dating/newly married when all of the books were coming out and we would listen to them on CD when we’d go on vacation. I remember sitting on my couch crying as I finished the final book and I love getting to share the magic of these books with my little muggle! 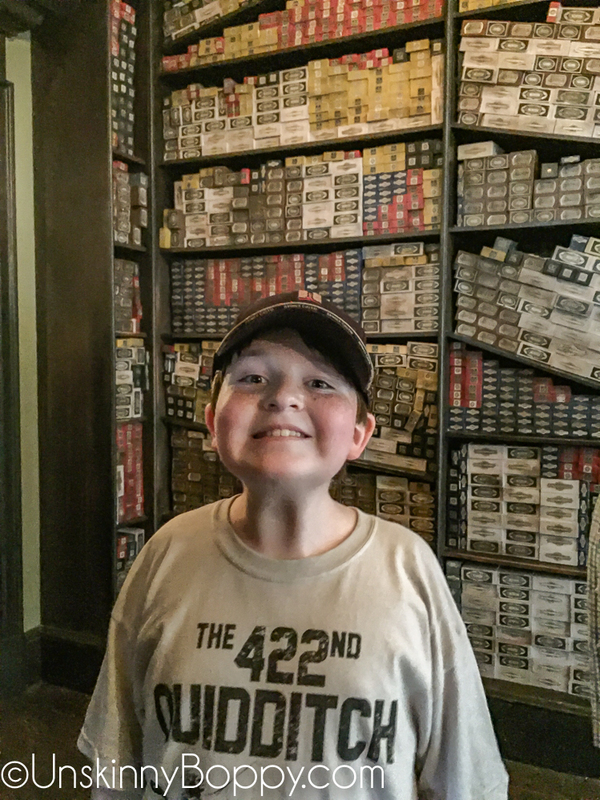 Loved reading this – I can only imagine the pure joy for your son as he’s such a big fan! I’ve been and it is truly magical, I loved every second being a big HP fan myself. Can’t wait for part 2!! We went a couple weeks ago. I admit I’d never seen a Harry Potter movie but now have started watching them from the start! It was an amazing thing to see and figure I’ll need to return at least a couple more times to see more.